Sheikh Nahyan bin Zayed, the chairman of Abu Dhabi Sports Council, ordered all remaining tickets for the semi-final to be purchased by his organisation, which has set up distribution points across the country and is giving the tickets away free. Tickets had been available online since July with about 19,000 having been sold. Immediately the UAE qualified for the semi-final by beating Australia 1-0, and were confirmed to meet geo-political rivals Qatar, the remaining tickets taken off sale. Qatar under tournament rules have an 8% allocation of tickets to all their matches. It is unlikely that they would have bought their official allocation knowing their fans would not travel. At this tournament, unlike at FIFA World Cups, ticket revenue goes to the Local Organising Committee. The Qataris may now be regretting that decision with the Omani fans having adopted the Qatari team once they were knocked out. At their semi-final match against South Korea more than 1,000 Omanis turned up to support the Qataris. It is unlikely they will be able to get tickets for tomorrows semi final against the UAE, leaving the Qataris to face what will likely be a hostile home crowd. 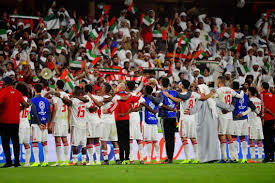 In a tweet following the game Sheikh Nahyan bin Zayed said: “We congratulate our distinguished leadership and the UAE citizens on our national team’s victory and for qualifying for Asian Cup 2019 semi-final. UAE fans packed into their quarter final match up against Australia in Al Ain, but had been noticeable by their absence in the last 16 group game with only 17,000 at the 43,000-capacity Zayed City Stadium. Asked whether the fans had stayed away as a protest against the way the team was playing, coach Alberto Zaccheroni said that he thought they stayed away because it was a cold night and they preferred to watch the game on TV. The forecast for tomorrow night is for 26 degrees at the 6pm kick-off time.